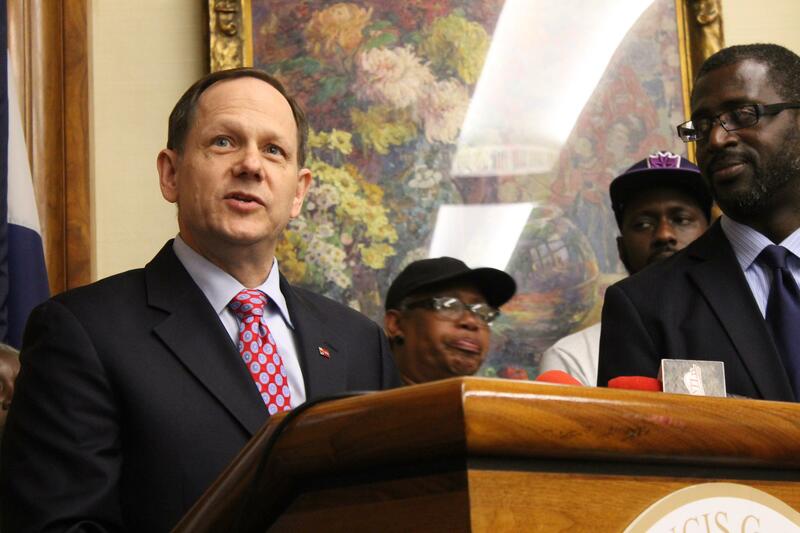 St. Louis Mayor Francis Slay says a statewide proposal that could lead to the end of the city's earnings tax "will most assuredly win in November" and he is concentrating his efforts and resources on the subsequent vote in April in the city only. In an interview with the Beacon, the mayor said, "I'm going to do everything I can to make sure that the earnings tax isn't eliminated unless and until there is a plan to replace it." But he conceded that the way Proposition A on the November ballot statewide is written, it is sure to pass because it gives voters in St. Louis and Kansas City the opportunity to vote on whether to retain the earnings tax, and it bars other cities in Missouri from imposing such a tax in the future. If Proposition A passes, city voters would decide in April whether to keep the earnings tax or have it phased out over 10 years. Slay said that ending the tax, which brings in $137.5 million a year, "will devastate the city." So rather than work against a proposition he feels will win easily, he wants to focus on making sure that city voters retain the tax. Even if voters were to decide to keep the tax next year, Proposition A would require a similar retention vote every five years after that. He noted that the sequence of votes can be confusing, since he and others who want the earnings tax to continue are urging voters to say no in November and yes in April. But he thinks when the vote is limited to city residents, they will back his position once they realize what the consequences would be. "What makes me feel good is it will be up to the people of St. Louis," Slay said. "That's the big difference in April. The November ballot will not be up only to the people of St. Louis. That's why I feel much better working on the April election." The campaign for passage of Proposition A is being backed by a group called Let Voters Decide. Its spokeswoman, Brooke Foster, said Friday that supporters are confident it will pass, not because of how it is written but because of the broad support it received on the petitions that put it on the ballot. "We are concentrating on the November vote," Foster said. "We are certainly not taking anything for granted. Our group was formed for this election. It was not formed to support the April 2011 vote." “Proposition A is a dangerous experiment that takes local control away from voters while placing families, small businesses, the firefighters and police who protect us in jeopardy. To protect vital services in St. Louis and Kansas City, and preserve the right of the 959 other cities in Missouri to determine how they fund essential local services; a growing coalition of business groups, civic organizations, elected officials, and labor unions across the state are mobilizing to oppose Proposition A. "As voters learn that Proposition A means higher property taxes, higher sales taxes, laid off police and firefighters, our confidence in a November victory grows." The 1 percent earnings tax, which has been in place since 1954, is levied on employees who either live in the city or work in the city, as well as on businesses located in the city. It has been blamed for the city's losing businesses to other metropolitan areas or to locations in St. Louis County or elsewhere in the region. It brings in about a third of the city's annual budget. Proposition A was put on the ballot after a petition drive backed by Rex Sinquefield, the wealthy political contributor who has given money to Slay in the past but has broken with the mayor on this issue. Sinquefield has spent more than $4 million on the effort. Slay said that he appreciates what Sinquefield has done for the city on other issues, but the earnings tax is too important to St. Louis to let it lapse. "Whatever things we've worked on in the past, and whatever other things we agree on, on this issue we disagree on the approach," Slay said. "I believe in my heart that Rex does not want to see this city in a position where we can't pay our bills. So I'm hoping that he will find it in his heart not to be pumping money into the campaign in April. "One thing that I want to make clear is for the April ballot, I'm going to be using my campaign fund to fight this, so the same money he has given me will be used to fight this in April." In a blog post earlier this year, Slay said that Sinquefield "has assured me that he will not support a campaign in the city of St. Louis until the city and the region have found a viable alternative." A spokesman for Sinquefield later denied that such an agreement had been reached. Slay said he didn't want to get into the difference of opinion at this point, except to say, "I'm still trying to convince him and others this is a very, very bad idea." As an alternative, he said, he is concentrating on making sure that the earnings tax remains in place "unless and until there is a plan to replace it, and that plan won't be in place by April." Kansas City Mayor Mark Funkhouser, whose city faces the same potential revenue cut as St. Louis if Proposition A passes, has said that if he loses money from the earnings tax, he would take a three-pronged approach to replacing it -- new taxes, budget cuts and privatization of some services. Slay said the budget situation in St. Louis, where a $46 million shortfall was covered by cuts and by institution of a trash pickup fee for the first time, would call for a different approach. He noted that whatever increases in revenue are approved would require action by aldermen, the Missouri Legislature and voters. One way the city could help ensure solvency, he said, would be for it to re-enter St. Louis County as a municipality, to get rid of duplications of many services. He has championed the idea in recent years, but it has gained little traction. If the city had another five years to come up with a plan to replace the earnings tax, Slay said that "everything would be on the table. I think what we need to focus on right now is to do everything we can to make sure the earnings tax is still in place until there is a way to replace it, and to find cost savings as well." He noted that the city's sales tax already is fairly high, compared with other municipalities in the area, and with other taxes, "you would basically put the burden that is now pretty broad-based onto property owners, business owners and the residents of the city of St. Louis. That's going to be hard to do." Slay acknowledged that the earnings tax may discourage people and businesses who are determining whether to locate in the city, "but I don't think it is as big a disincentive as some people think it is. I think the debate is a good debate. Should we keep it? Should we reduce it? You can cut it in half, and the burden of replacing it would be not as great." Slay acknowledged that by shifting his attention to April instead of November, he is employing a strategy that is different from others. "There are those who may disagree with my approach," he said, "and I disagree with theirs. But we are all on the same page. I don't know of anybody who believes it would be a good thing to get rid of the earnings tax, including Rex Sinquefield, unless and until there is an acceptable plan to replace it. Everybody is on the same page on that."